The Shinra Company is rapidly increasing its influence through its monopply on make energy and military might. With the burgeoning city of Midgar on its base and symbol of prosperity, Shinra is on the verge of establishing absolute dominance over the world. 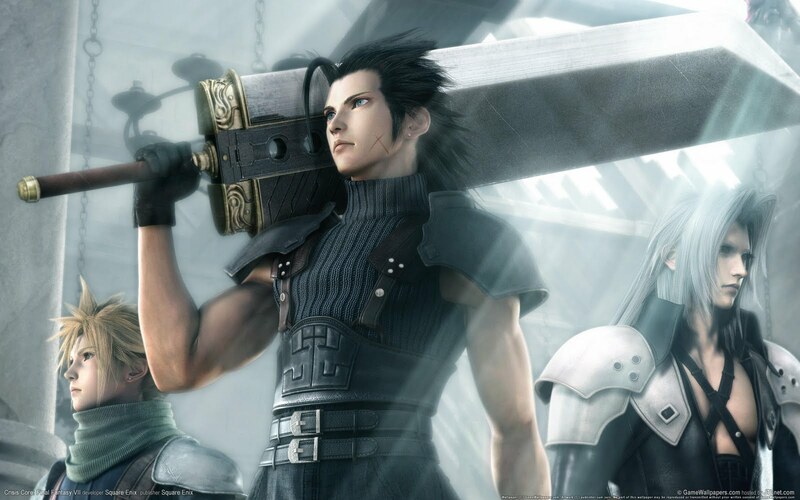 SOLIDER is a group of skilled combat operatives within Shinra. The elite within the group - those strong enough to be deemed SOLIDER 1st Class - are respected and idolized by the citizenry. Zack is a young SOLIDER 2nd Class who aspires to become a 1st. He spends his days carrying out the assignments under the guidance of his 1st Class Mentor, Angeal. During an operation in Wutai, a large number of SOLIDER members, led by 1st Class operative Genesis, go missing. The severity of the situation prompts Shinra executives to deploy even more SOLIDER operatives in hopes of bringing an end to the war with Wutai, and conducting an investigation into the mass desertion. 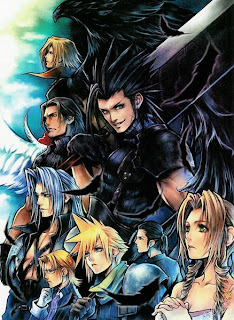 The one assigned to mission are Zack, Angeal and the 1st Class hero who is known the world over as Sephiroth. >The battle system is knows as the Digital Mind Wave(DMW), and it revolves around a series of reels at the upper left corner of the screen which spin continuously as long as there are Solider Points (SP) left to consume. Each reel rotates independently and upon lining up three reels of the same character and value, a power-up is awarded to Zack. Yay! Materia makes a return. =D Materia becomes fully customizable and in multiple varieties, including green and yellow. In addition, Materia can be fused together to enhance the Materia's abilities or to make an entirely new materia. The Materia the player has equipped determine the magic and special commands on the battle menu. Oh ya, the summoned creatures in Crisis Core are very beautifully animated in 3D form. O_O The 3D generated animation is almost like the reality. Oh ya, different to Final Fantasy VII, Summon Materia are no longer in control by the player and instead, are added to DMW. By special circumstances at random, the DMW slots would switch the summoning reels, where one of various summon materias are selected and performed by the player. And there are side quests called MISSIONS as well. I was enjoying those MISSIONS until in the middle of game, the MISSIONS become tougher along with the stronger monsters. @_@ I only managed to managed 50% of the MISSIONS when this game comes to the end. The total of MISSIONS is 300! @_@ Hmmph, I will re-play CC again when I'm free, not now. Hopefully, I can complete all the missions when I play CC in future! Gam bat teh! !